Surveying and Land have lots of myths, partial truths, misconceptions and erroneous beliefs. Take a look at a few widely held “common knowledge” statements. Things would be simple if this was actually true. 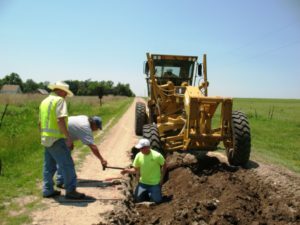 Eastern & Central Kansas has many, many rural roads that were not opened on the section line on purpose, let alone the ones that were not built on the line in the first place. Many other roads have been pushed away from hedge rows through road maintenance or realigned due to a culvert or bridge. As a general rule, most Federal & State Highways are not centered on the Section lines. And section lines do not magically drift to the “correct” position (middle of the road) over a period of years, nor do the roads mysteriously move themselves to the Section lines! Besides, how do you define the “middle of the road”? In the photo, the cornerstone is about 5 feet south of where most would call the “middle of the road”. Well, actually you don’t. That abbreviated writing is NOT a boundary description. It was written for the convenience of the County Appraiser as a location and is not copied from your deed ON PURPOSE. It is not and never was intended to be a boundary description. Most tax statements say this, usually in fine print. It may, however, help us find your actual recorded description. If you have title insurance, then we would like to see Schedule A & B of the Commitment for Title. Unfortunately for the new buyer, this statement is most likely false. Kansas was (and somewhat remains) a buyer beware State. Too often neighbors, realtors or the former owners will tell the buyers where they think the boundary lines are without any real knowledge other than “this is what I was told when I bought it” or “this is where the appraiser’s map shows it.” Guesses by the seller or realtor are free, while surveys are not! Generally speaking, the more the property is worth, the greater the chance that it has been recently surveyed. Also, a product used for Title Insurance purposes only, the Mortgagee Title Inspection (MTI), has added to the confusion over the years. See our Work Order for an explanation of what the MTI does not do for boundary lines. As a potential buyer, you should insist that your new property have a boundary survey done, if nothing else for your own piece of mind. We regularly see stunned and dismayed land owners that now regret not having had their place surveyed at the time of purchase. We hear way to often “But that’s not where they told me the line was!”. Our sophisticated GPS units and a pocket tape have a lot in common. They are both tools you can use to measure a distance. If none of the boundary corners are given in highly accurate Latitude and Longitude or State Pl ane Coordinates, which is extremely unlikely, then no amount of technology will pin point a location in of itself. Besides, and this is the most important point, it’s the application of historical surveys and legal principles to your boundary description that determines the locations of boundary lines, not the tools. Having a well appointed and stocked kitchen doesn’t make you a Master Chef! Also, the distance between any two lat/long points changes with elevation. The closer to the center of the earth, the nearer those coordinate pairs are together, while boundary descriptions contain horizontal ground distances. One of the problems with estimating surveying fees is that it is a professional service. Most professional fees are time based. How much time is needed to do a survey is NOT necessarily dependent on the size of the tract or lot. As boundary descriptions are unique, so are most boundary situations and so is the time needed to survey a particular tract. Expect a surveyor to ask a lot of questions about what, where and sometimes why. Don’t be surprised if you can’t get an answer immediately. It would be a little like calling up an auto mechanic and saying “My car doesn’t run, how much will it cost to get it fixed?” and then expecting an immediate quote over the phone. No, you need a Professional Surveyor. 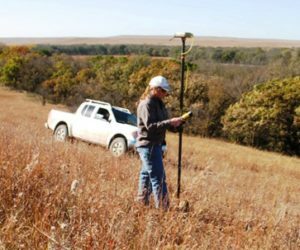 Only Professional Surveyors are authorized to do any surveying of “real property for the establishment of land boundaries, rights-of-way, easements and the dependent or independent surveys of the public land survey system.” It’s state law. KSA 74-7003 (p) (2). 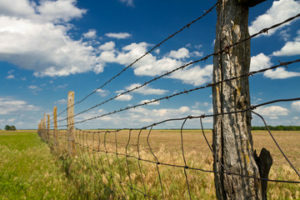 When it comes to land boundaries, the land owner is also prohibited from surveying their own land. No you don’t. Even if the road was opened up “on the line” (see the first myth), the county appraiser, by law, gives you ample credit for that part used by the public as an easement. And this applies to State and Federal highways too. While you may own to the “middle of road”, you are not paying taxes on the land area used as an easement. This is why the Appraiser’s area is invariably less than the actual surveyed area. (Usually about two acres per half mile of road frontage in rural areas) This myth is a personal favorite of ours because it is so common and so not true! The GIS systems statewide are excellent tools put together by highly trained and professional mappers. But due to a lack of actual photo identifiable ground control, these dedicated professionals are not only forced to make assumptions as to location of section corners, but they also have to abide by the State’s Property Valuation Division rules on property mapping. All GIS maps have a note that reads something like “Not survey accurate”. Be assured that they really mean it.